This story originally appeared on March 22, 2015. In the early Space Age, everything seemed possible — no matter how crazy. Which is why, in the 1960s, one American engineer seriously designed a space rocket to transport troops wearing jetpacks. This far-out concept aimed to lob Marine jet-battalions into space and land them on the other side of the world in less than an hour. It was all about ending what the U.S. military calls the “tyranny of distance.” That is, moving soldiers and material overseas in a short amount of time. Today, the Pentagon invests billions of dollars in bases, cargo ships and heavy transport planes to give the military unmatched global reach. But it still takes hours — even weeks — to transport troops and equipment around the world. Rockets and ballistic missiles cross those distances in minutes. What if — instead of warheads — they carried soldiers into battle? Marine general Wallace Greene, Jr., publicly proposed a ballistic transport system when Pres. John F. Kennedy nominated him to lead the Marine Corps in October 1963. “The impact of this application of space technology on the projection of national military power is staggering to contemplate,” Greene said. But not surprisingly, it was rocket scientist Wernher Von Braun who first tinkered with ballistic troop transports. In 1956, the Army Ballistic Missile Agency — under Von Braun’s direction — proposed to loft an 18-man troop capsule into space with a Jupiter rocket. Two years later, the agency replaced the Jupiter with a more powerful Redstone rocket. Both early concepts relied on parachutes and retrorockets to get the troops safely to the ground. However, the transport concepts had short ranges, roughly equivalent to a helicopter. But Philip Bono—a maverick rocket scientist at Douglas Aircraft — imagined something much grander. Bono wanted to ditch the Jupiter and Redstone’s wasteful, inelegant multistage rockets in favor of an advanced, doughnut-shaped engine known as an aerospike. In a single-stage aerospike, lots of small rockets point down in a ring around the engine’s blunt, rounded base. The combined thrust of all these rockets creates huge amounts of vertical lift. The rounded base also doubles as a heat shield during reentry. Bono’s design, which he called Rombus, carried its oxidizer inside the vehicle. In addition, it had detachable hydrogen fuel tanks on the outside. This made the vehicle reusable. Bono realized that Rombus could hurl tremendous payloads into orbit … and across the world. In late 1963, he modified his space booster into the Intercontinental Aerospacecraft Range Unlimited System, or Icarus. The name didn’t last. The mythical Icarus was the Greek son of a craftsman who plunged to his death while trying to escape from Crete using wings. Soon, Icarus became Ithacus. Ithacus was a very bold idea. In theory, 1,200 Marines would board the 20-story rocket and blast off from Vandenberg Air Force Base or Cape Canaveral. They’d soar 120 miles into space, and land at their destinations in Asia, Africa or Europe within an hour. Had it ever left the drawing board, Ithacus’ half-million pound payload could have sent 130 tons of cargo just as far — and just as fast — as Icarus would have. During cargo flights, the crew would have ridden in a Star Wars-style escape pod, bailing out in case of disaster. But the troop transport version lacked the escape pod, presumably for morale reasons. Troops would strap themselves into acceleration couches on six decks — their gear stored within reach. Upon landing, the Marines would have exited the rocket via jetpacks and giant slides. Winches and cranes would lower cargo from the troop decks to the ground. Once securing the landing zone, the Marines would next refuel Ithacus enough for it to hover on its aerospike and fly itself to a coastline. There, a giant barge and derrick would carry it back to the United States for reuse. Alongside the giant Ithacus, Bono proposed a smaller version called Ithacus 100-T. It was only half the size of the larger rocket, and would carry just 170 Marines — or 60 tons of cargo — the same distance and speed. The smaller rocket posed fewer recovery difficulties and was small enough to launch from a ship. 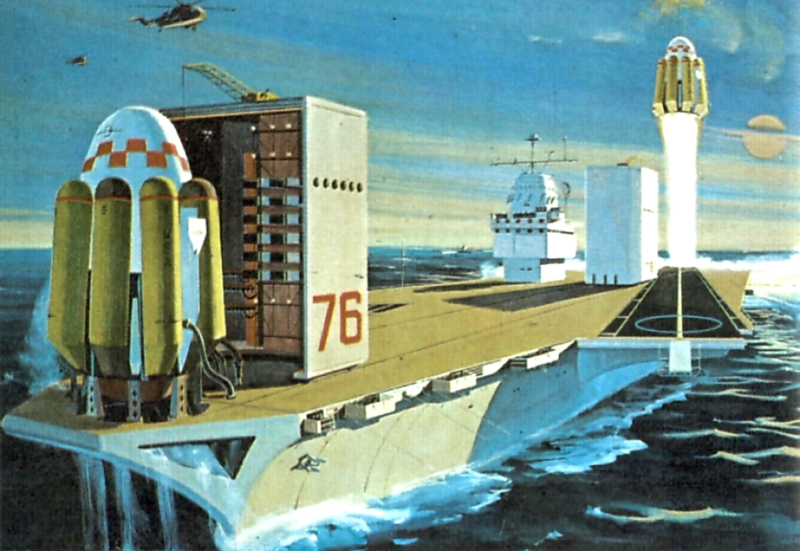 A remarkable illustration from the era depicts two Ithacus 100-T’s aboard an Enterprise-class aircraft carrier doubling as a floating spaceport. The carrier’s nuclear reactors would provide the electricity to split seawater into hydrogen and oxygen — and liquefy it into rocket fuel. To be sure, Ithacus was a far out idea, but it wasn’t technically impossible. Its development was well within the capabilities of an industrialized country building workable moon rockets. The Pentagon could have deployed its rocket transports by the early 1980s. Plus, rockets launched from sea have more flexibility. You could more easily sync up the launch sites with the earth’s rotation — adding greater speed. But practically speaking? It was never really feasible. Ballistic missile defenses didn’t exist in the early 1960s, but the notion of dropping a 20-story building into contested airspace today seems dubious. Ithacus could conceivably carry countermeasures, if it sacrificed other payloads. But there are other problems. Namely, other countries wouldn’t be able to tell it apart from a nuclear weapon. A Soviet or Chinese ballistic missile-detection system would simply see a ballistic missile screaming through the atmosphere. Moscow or Beijing would have minutes to decide whether it was a troop transport — or the beginning of a nuclear first strike. Actually using the system could inadvertently trigger a nuclear war. Then there are the more practical issues. Could Ithacus have landed safely in a conflict zone? Could troops have exited the rocket fast enough to survive attacks? Freaking jetpacks and giant slides … really? After landing, could Marines really have refueled the rocket in order to fly home? Plus, compared to conventional aircraft or ships, a rocket is a heck of an expensive way to transport troops. Bono realized Ithacus was too costly for Douglas Aircraft to develop on its own — and the military wasn’t buying. It could only come about as a spinoff of the space program … or for commercial interests. But passenger-rocket concepts never truly went away. Burt Rutan’s SpaceShip One — the technology behind Virgin Galactic and StratoLaunch — inspired the Pentagon to reconsider rocket transports after 9/11. Between 2002 and 2009, the Small Unit Space Transport and Insertion concept made headway within Pentagon development circles. 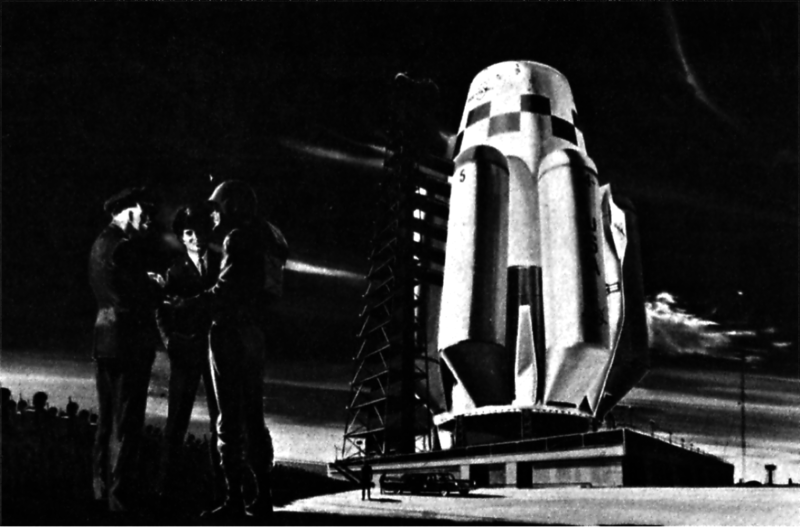 The concept envisioned a small space plane to carry U.S. troops. The financial crisis, recession and military-budget sequestration killed it off. But there’s a lot of interesting work still happening in the private sector. SpaceX’s next generation of reusable rockets and capsules will be able to make precision landings under their own power. Though the company’s Dragon II spaceship only holds seven people — or a few tons of cargo — it could be larger. Elon Musk’s proposed Mars Colonial Transporter might carry enormous payloads across the world, if not to other planets. But don’t hold your breath. Rocketry is hard. Blasting a battalion of Marines into space and to anywhere on Earth — within minutes — is a lot harder.